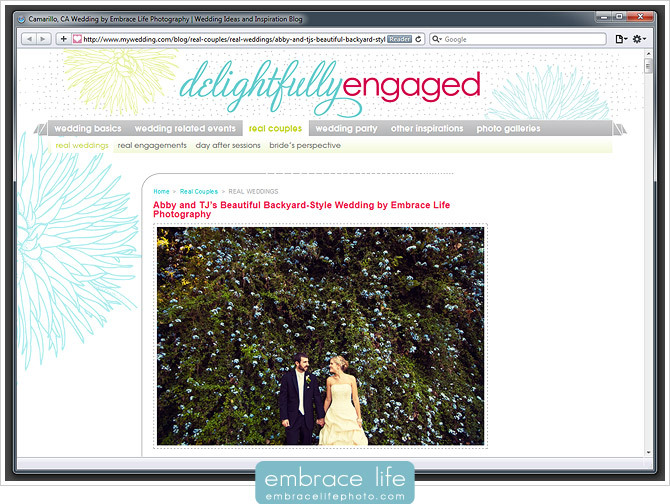 Once again, Delightfully Engaged has beat us to featuring one of our own weddings! I just love how the editor, Sarah, chose to showcase Abby and T.J.’s gorgeous, outdoor Camarillo wedding photography at McCormick Home Ranch – her image pairings are perfect! To see this beautiful feature on Delightfully Engaged, click here. Abby and T.J.’s wedding is such a nice example of a backyard style, ranch wedding. Hopefully we’ll make our own blog post about it soon, too. Until then, enjoy the great work that Delightfully Engaged has done!